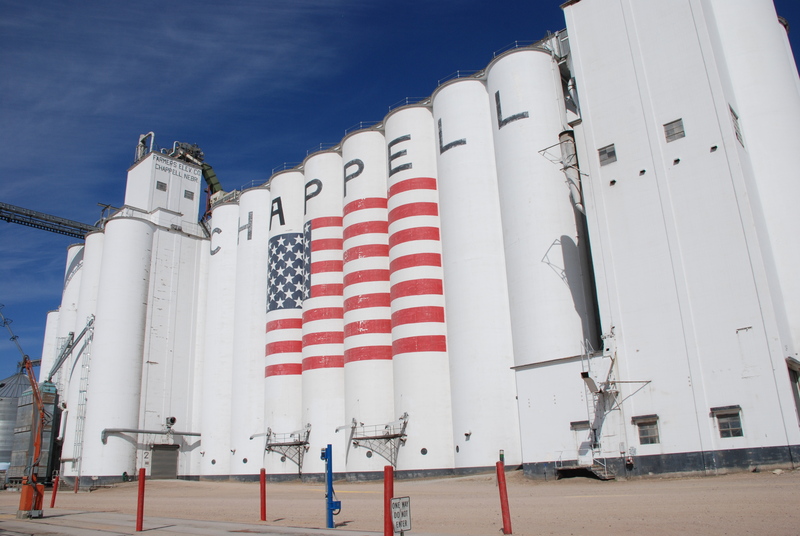 The Chappell, Nebraska elevator built by Chalmers & Borton. My grandfather William Osborn built an elevator in the western Nebraska town of Chappell, according to my dad Jerry Osborn. Dad’s recollections have guided our search thus far, for Mayer-Osborn elevators. Surely over the kitchen table he heard the names of towns where his absent father had construction jobs. Or perhaps he saw the postmarks of letters sent home. Chappell was probably stamped on one of those postmarked letters, or it was the nearest town with a motel, because when I went to visit in 2011, there was nary a Mayer-Osborn elevator in evidence. Impressive elevators there were, but I found out later that they all had the ubiquitous Chalmers & Borton nameplate, the trademark of Grandpa’s biggest competitor. The Mayer-Osborn elevator at Big Springs, Neb. 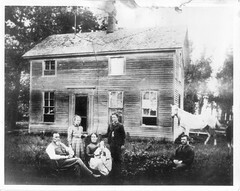 lacked the annex when it was first built. 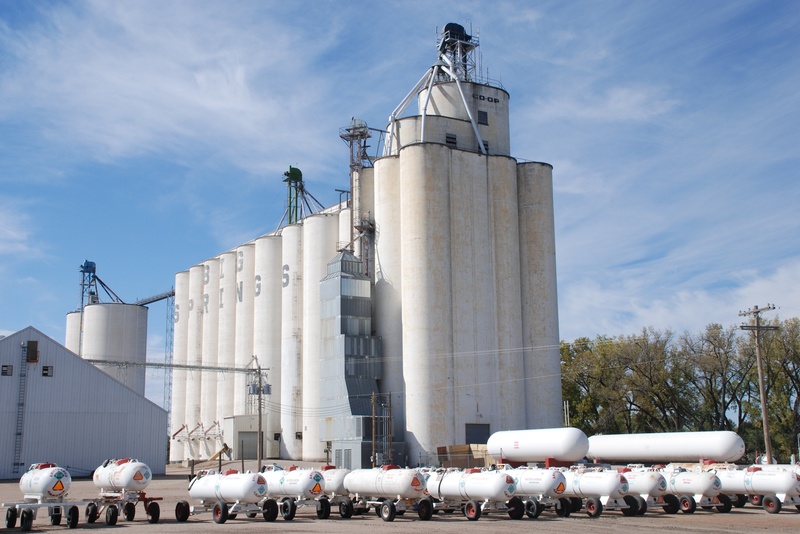 It is the same style as used in McCook, Neb., and Blencoe, Iowa. One stop east on the rail line, however, was a large, handsome elevator that looked like one of Mayer-Osborn’s jobs. It was the spitting image of the first elevator Grandpa built on his own at McCook, Neb. The first time I saw it, I was curious enough to snap a photo, but identification was going to wait for another year. My dad knew nothing about Big Springs. When Gary Rich, a contributor to this blog, looked into the builders of the elevators he photographed, he solved the mystery. He identified the Big Springs elevator by its manhole covers inside the driveway, each embossed with “Mayer-Osborn Construction, Denver, Colo.” above the Hutchinson Foundry stamp. 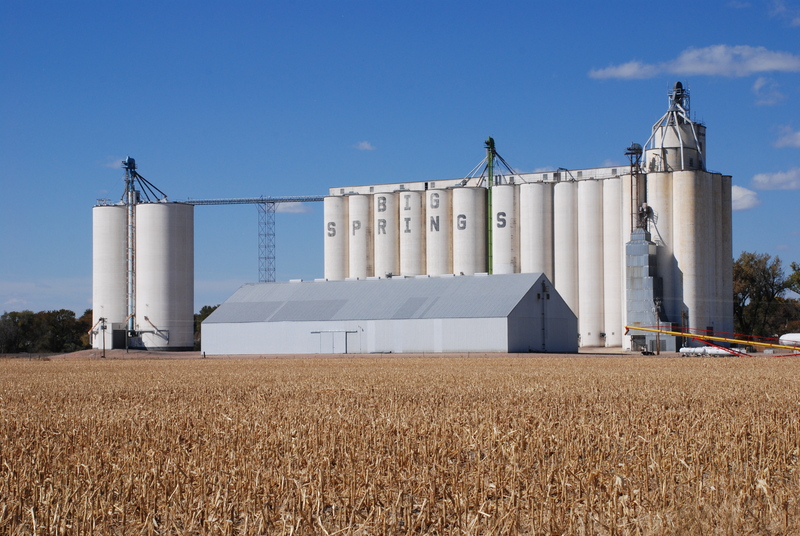 The Big Springs, Neb., elevator in October, 2012. I paid another visit to Big Springs last fall after our Wyoming elk hunt. We didn’t get any elk, but I did get some nice photographs of the elevator. It was a sleepy Sunday with no one around. Next time, perhaps I can see inside. It is an honor to pay respects to my grandfather’s enduring work. It is living history of a kind that is rarely noticed or mentioned. Once gone, it is scarcely remembered except in dusty repositories of pictures, and in mostly forgotten stories. At Big Springs, Neb., that day of fading away is still far off in the future. This entry was posted in Mayer-Osborn, Miscellany, Photography, Their Work, William Osborn and tagged architecture, Big Springs Nebraska, Business, Chalmers and Borton, Chappell Nebraska, construction, grain elevator, Mayer-Osborn Company, McCook Nebraska, photography, slip-formed concrete, William Osborn. Love the photos — keep up the good work for your family!